How to Prepare for IBPS Specialist Officer 2016 Exam: Institute of Banking Personnel Selection will be conducting IBPS SO 2016 on the 30th of January 2016. This will be the first level in the recruitment process. For the aspirants who are still unaware of IBPS Specialist Officer 2016 Syllabus and Exam Pattern, don’t worry. IBPS Specialist Officer Exam 2016 is conducted for multiple posts, which are H.R. Officer, Law, IT, Marketing and Agriculture Officer and Rajbhashadhikari Officer. It is a computer-based test (CBT) which consist of 4 sections, namely, Reasoning Ability, English, Quantitative Aptitude or General Awareness and Professional Knowledge. There are total 200 questions, carrying 1 mark each with 0.25 mark negative marking for incorrect ones. We have mentioned IBPS SO Preparation Tips 2016 after the exam pattern section of this article. Since we are only one and a half month away from IBPS SO 2016, it is advisable to follow a strict routine in terms of preparation and revision for the exam. So, for all those who are still confused how to proceed, read these IBPS SO Preparation Tips 2016 carefully. This should be your first step. Read the Official Notification for IBPS Specialist Officer Exam 2016. You can get complete information regarding IBPS SO Syllabus 2016 from it. Once you know the topics covered in IBPS SO 2016 Syllabus, you can segregate the ones you know from the ones you are not confident in. Technically, this is the first thing you must do. Analysing previous years solved IBPS SO Papers will help in getting familiar with the exam pattern. It will also give a rough idea about the expected level of difficulty of the questions that might be asked in IBPS SO 2016. Accuracy trumps Number of Attempts. In simple words, attempting more and more questions shouldn’t be your strategy. Accuracy should be the main objective. Develop a proper strategy for solving questions with maximum accuracy. An overall attempt of 50-55% with 85% accuracy will be good enough. Time is the main essence here. There will be 4 sections. First, read the exam guidelines carefully. Second, try and scan the entire paper in 5-10 minutes. Third, Select a particular section and start attempting. Avoid getting consumed by a tricky question. You have only 120 minutes for 200 questions. And do not forget to do the main exercise – Self Analysis. You need to rate your performance and see where you need improvement. Even if you are able to cover the essential mistakes, chances of cracking IBPS SO 2016 Exam will increase exponentially. 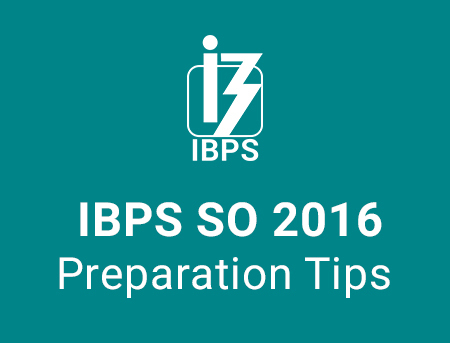 We hope our IBPS SO Preparation Tips 2016 will prove beneficial for you. If you have any queries, please mention in the comments below. To understand the exam pattern and level of difficulty of the questions asked, it would be better to try a few mock tests. Sir for IT officer exam proffesional knowledge is computer’s related questions or any other ?